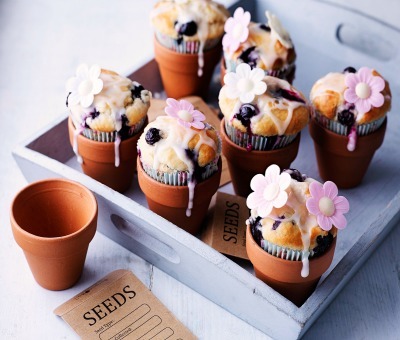 These quick and delicious blueberry flowerpot muffins will make for the ideal homemade gift on Mother’s Day. They are also great for bake sales – we are sure they’ll sell out quickly! 1. Pre-heat the oven to 190°C, (fan 170°C), Gas Mark 5. 2. Sift together the flour, baking powder and salt into a large bowl. Stir in the lemon zest. 3. Beat together the oil, egg, water and condensed milk. Add to the dry ingredients and mix well. Stir in the blueberries. Divide the mixture between the prepared cases. Bake for 20-25 minutes or until well risen. Transfer to a cooling rack to cool. 4. When the muffins have cooled, sift the icing sugar into a small bowl, then add the lemon rind and juice, stir until you have a smooth icing, adding a little more lemon juice if necessary. Drizzle over the muffins and decorate with the flowers.